The United States Army is the branch of the United States armed forces responsible for land-based military operations. It is the largest and oldest established branch of the U.S. military, and is one of seven uniformed services. The modern Army has its roots in the Continental Army which was formed on 14 June 1775, before the establishment of the United States, to meet the demands of the American Revolutionary War. 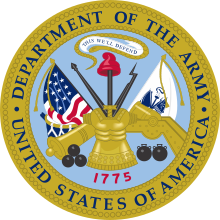 Congress created the United States Army on 14 June 1784 after the end of the war to replace the disbanded Continental Army. The Army considers itself to be descended from the Continental Army and thus dates its inception from the origins of that force. — Excerpted from United States Army on Wikipedia, the free encyclopedia. This page was last edited on 3 November 2016, at 11:07.